“The Chinese government has never recognised the so-called ‘Arunachal Pradesh’ and is firmly opposed to the Indian leader’s visit,” Chinese foreign ministry spokesperson Hua Chunying said in a statement. “China urges the Indian side to... refrain from any action that may lead to the escalation of disputes or complicate the boundary question,” added Hua, some hours after Modi’s visit to the contested area, during which he inaugurated building work for two airports. Relations between New Delhi and Beijing have been marked by distrust since a brief but bloody 1962 border war, during which the two fought over Arunachal Pradesh, with Chinese troops temporarily capturing part of the Himalayan territory. The dispute remains unresolved, with India considering Arunachal Pradesh one of its northeastern states while China claims about 90,000 square kilometres of the territory. 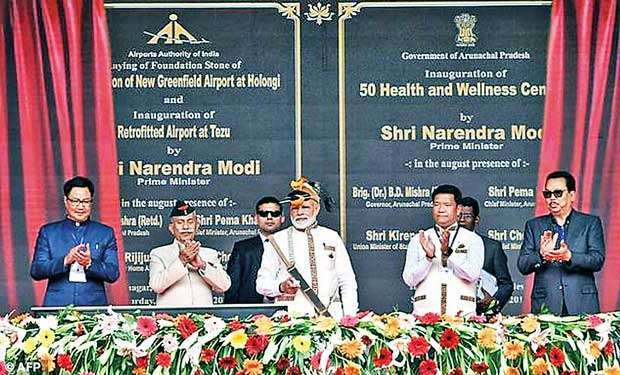 “Indian leaders visit Arunachal Pradesh from time to time, as they visit other parts of India. This consistent position has been conveyed to the Chinese side on several occasions,” India’s foreign ministry said in a statement Saturday.